That was before I learned about Charlotte Mason. Things have changed a little in our home, although you will still see a few battery operated toys here and there. Even though Charlotte Mason only tangentially mentioned toys in her volumes, there are a few Parent’s Review articles that share some guidance in this area. Some education philosophies come with their own toys: Montessori toys, Waldorf toys…there are no Charlotte Mason toys. But in the Parents’ Review article, “Our Children’s Play: Their Toys and Books,” Mrs C Hatchell describes some principles for choosing toys. In Mrs. Hatchell’s article, she describes finite and suggestive toys. Today, these are most often referred to as active and passive toys. Finite, or active toys, do the work for your child. They entertain rather than meaningfully engage. Finite toys do not allow much room for playing and creativity. They have one distinct purpose. Froebel, the Father of Kindergarten, whom Charlotte Mason respected, was a proponent of mobiles for infants. However, he was also a proponent of creative, free play, and even created a set of open-ended toys called Froebel’s Gifts, with which children used to create and demonstrate their strengths. Like I mentioned before, there aren’t really Charlotte Mason toys, but Mrs. Hatchell did recommend some specific things for children to play with. LA Newborn doll and bath tub – Miss H requested this newborn baby doll shortly after her baby brother was born. Her name is Martha, and she is a favorite toy in our family. Both of our older children enjoy giving Martha baths, feeding her, and changing her. I can see how these actions build habits of kindness, gentleness, and attentiveness. Is this too perfect for a child? the continually increasing wealth and perfection of toys also serve to produce dullness in children, or else destructiveness as the only form of activity left to them in relation to these too-perfect toys. It’s up to you to decide how perfect is too perfect. Are you going to get upset if something happens to the toy? Twaddle is the word Charlotte Mason used to describe books that are silly and meaningless. The word usually describes speech or writing, but I think we can stretch it to mean anything trivial or foolish. Is the toy dumbed-down? 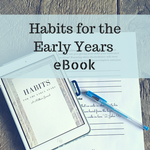 What habits will this help my child develop? This is a question I haven’t yet asked myself about the toys we own, but after reading Mrs. Hatchell’s words, I think it’s an important one. In addition to habits, I think some toys afford great opportunities in developing skills, like fine or gross motor skills. For more toy ideas, you can visit my Amazon affiliate store. Not totally related, but reading this reminded me of a time about a year ago when my 3 year old was playing with an imaginary Princess Jasmine. I thought I’d be a cool mom and I printed her off a Jasmine and a magic carpet to play with. She didn’t even take one glance at it. Her version was so much more magical and interactive than the one I created for her. That’s a great example, Jessica! H’s imagination is much bigger than I give it credit for! I totally get this. Its crazy how we think one thing before having kids and then realize that things don’t always go as planned, especially with kids. It’s so true! I should probably think about all of those other things that haven’t gone as planned!